available. Just take a walk through the woods and you’ll see a vast array of the stuff. Most of the time we don’t pay much attention to the rotting logs and branches along our way, unless we’re looking for mushrooms, moss, fungi, or insects. But deadwood is a critical part of the ecological cycle. Although we think of deadwood as merely dead trees, deadwood provides nutrients for a range of plants and animals, as well as a new generation of trees. The last stage of organic decomposition produces new soil. The whole process is identical to what takes place in a compost pile or bin. The dead thus produce new life. As you view these photograph’s you might consider this upbeat deadwood perspective. Millions of tons of wood are produced every year in the forests of the world. Observation, however, tells us that the sum-total of wood upon he surface of the earth remains fairly constant from year to year and from century to century. We must, therefore, conclude that there are destructive agencies at work by which millions of tons of wood are destroyed annually. Since light levels tends to be lower in the woods, due to foliage and shadows, supplemental flash is necessary for producing high quality photographs. I’m using a Canon Speedlight 430 EX II with a short off-camera cable so I have control over the flash’s direction. 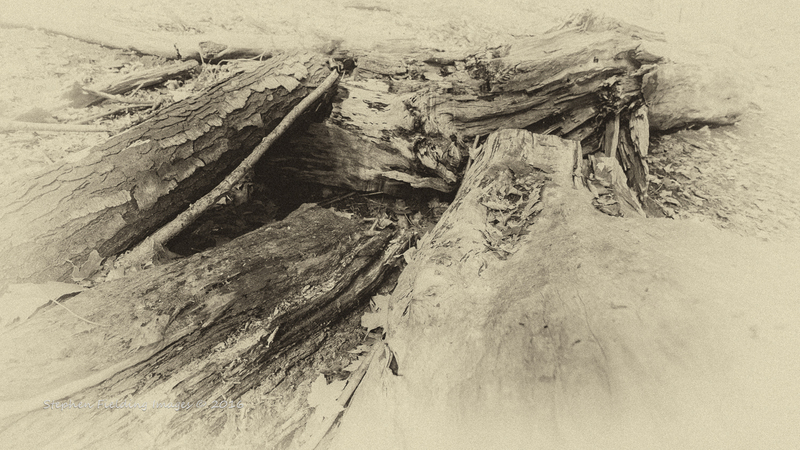 You can see more of my deadwood series at my online gallery. I’d appreciate receiving your comments or criticism. For more information on wood decomposition, see Trees for Life.